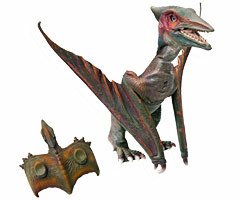 When people talk about getting a Roboraptor Pal for their favorite robot dinosaur, the are usually referring to the Mini Roboraptor; which is a smaller less function (but still fun) version of the highly advanced Roboraptor. However, being a d inosaur nut myself I have found other small robotic dinosaur pals for my green Sharper Image Roboraptor named Fluffy, which you can see on the left. 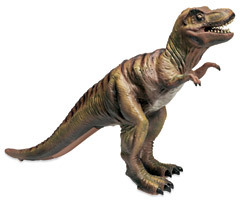 The Discovery Channel, the same people that make those wonderful educational dinosaur TV programs and sell the mysterious Black Roboraptor, also have a few reasonably priced animatronic dinosaurs. I have two of them; the T-Rex and the Pterodactyl. As far as functionality goes, they are somewhere between the powerfully smart Roboraptor and the cute but limited Mini Roboraptor. They each have several recorded dinosaur calls that can be activated by the remote control, and a few functions like walking and turning, and moving their head and jaws or in the Pterodactyl�s case, flapping it�s wings. But that�s about it. Roboraptor Review - Roboraptor News Blog! If you are looking for a full featured robot like the Roboraptor, then they aren�t for you. But if you are looking for a reasonably priced gift for someone, perhaps a youngster, or just love to collect dinosaur robots like me then they are great fun. Visit the Discovery Channel store if you want to get one. HOT OFF THE PRESSES! - Our Robosapien Robot Movie is here!